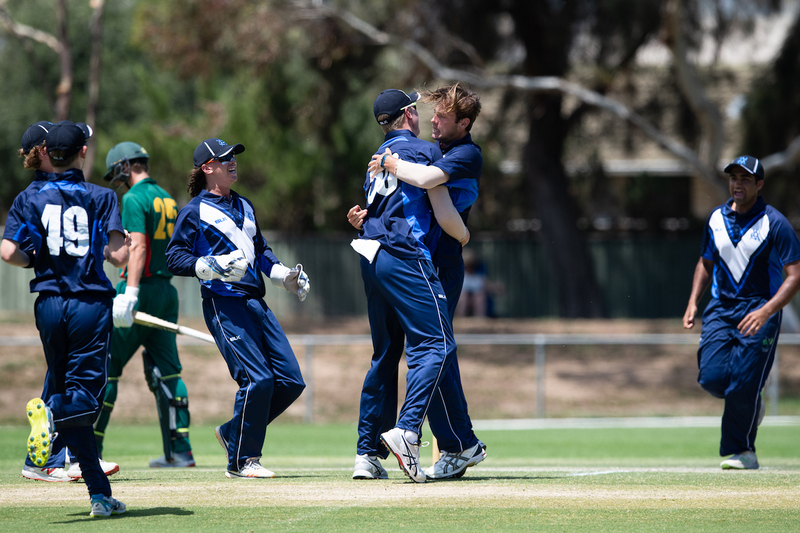 NSW Metro and ACT/NSW Country remain unbeaten and sit on top of Pool A and Pool B respectively after three rounds at the 2018-19 Under 19 Male National Championships in Adelaide. Sam Fanning continued his hot form for NSW Metro, pumping 92 off just 54 deliveries in a 124-run win against the Cricket Australia XI. The left-hander found support from Liam Scott (86), Austin Waugh (49) and Ollie Davies (41) to lead NSW Metro to a total of 5-330. Sam Rahaley top-scored for the CA XI with 79, but three wickets to Joel Foster helped dismiss the young side for 206. ACT/NSW Country cruised to a convincing win against Western Australia, winning by 163 runs. Will Fort (72) and Blake Nikitaras (65) led ACT/NSW Country to 4-295, before Kaleb Phillips claimed 3-37 to dismiss the boys from the west for just 132. A second century for the carnival to Bailey Capel led South Australia to victory. Capel's unbeaten 110 saw the host state cruise to an eight-wicket win against the Northern Territory. Leg-spinners Josh Hoffman and Lloyd Pope claimed three scalps each for South Australia. In a high-scoring contest, Queensland won by 23 runs against Victoria Country. Half-centuries to Connor Sully (69), Angus Lovell (52) and Corey Hunter (52) guided Queensland to 9-290, despite three Vic Country bowlers claiming three wickets each. Tom Jackson (89) and Yash Pednekar (68) led the run chase for Victoria Country, but Josh Kann's 3-10 saw Queensland dismiss their opponents for 267. Victoria Metro claimed a 67-run win against Tasmania. Elliott Brandon-Jones (74) and Noah Croes (61) were the Victorians' leading run-scorers, as Kade Applebee claimed a five-wicket haul for the Tasmanians. In reply, Connor Rutland claimed 4-20, to dismiss Tasmania for 178.